This Zen garden is more than just a great looking desk ornament. 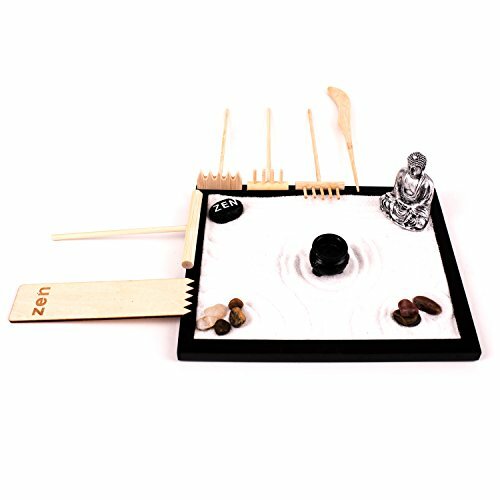 Zen Gardens offer a simple way to practice mindfulness meditation in a fun and engaging way. How? By simply taking a few minutes to focus intently on the sand and stones of this Zen Garden, you're taking a small break to clear your mind from the stress and anxiety of everyday life. That's it. KIT INCLUDES: Wooden base, white sand, stones, decorative "Zen" stone, 2 figurines and 6 bamboo rakes. If you have any questions about this product by Wonderful Zen, contact us by completing and submitting the form below. If you are looking for a specif part number, please include it with your message.